One of the great aspects of Buenos Aires is its glorious sunshine. Leisure, on a day such as today, is a privilege to take advantage of and a great way to do this is by exploring the Tres de Febrero parks in Palermo. Between Av. Libertador and Lugones, and extending from Av. Casares in Palermo to La Pampa in Belgrano, this group of parks is composed of 25ha made up of 15 public parks and 21 private sport clubs. Some of the highlights for those getting to know the city include the “Rosedal”, an extensive rose garden, the Sivori museum of art, the planetarium and the Japanese gardens which host a myriad of activities related to Japanese culture. Originally the land belonged to Juan Manuel de Rosas, one of the first famous caudillos and governor of Buenos Aires. Upon his defeat at the battle of Caseros which took place on the Third of February of 1852 (hence the name of the park), the civil war ended and the lands became public property. On 11th of November of 1875 President Nicolas Avellaneda inaugurated the parks by planting a magnolia americana (grandiflora) which is still standing today next to the Adolfo Berro Avenue, nearby the Japanese gardens. 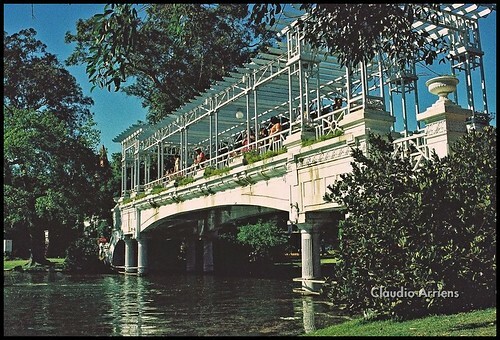 This entry was posted in Uncategorized and tagged argentina, Art museums in Buenos Aires,, Buenos Aires outdoors, Buenos Aires parks, buenos aires,, Japanese garden, Jardin Japones, Parque 3 de Febrero, Planetarium, Rosedal, tourism by Fierro Hotel Staff. Bookmark the permalink.